At this years ExhibitorLive! 2015, social media was all a-buzz. People were tweeting, taking selfies and posting their experience as it happened. But at a trade show, when we put down our Smart Phones, what is left? That being said, we need to keep on top of all of the trends; not just those technology related. In an article recapping some of the trends discussed at the convention, three stood out as exciting for our trade show display customers. Interestingly enough, E&E is already on target with a few of them. Let’s start with color, neon colors, that is. The 80’s are back! Especially neon green and orange in both fabrics and lighting. If you have the right product to get away with using neon colors, you will certainly stand out in a crowd from a mile away. Cut through the sea of blue and islands of red with bright, eye-popping colors. Remember the Dodge Neon and the color choices you could select? If you ever rented one, it was easy to spot in the parking lot because of the bright color. 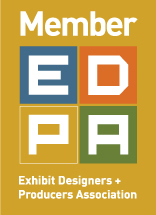 E&E Exhibit Solutions was just received The Star Award from The Pulse in the City News for our work with manufacturers and construction firms. The latest in digital print technology allows us to use interesting materials like wood, brick, steel and more and create an interesting visual story. Creating an industrial workshop look is another of the many interesting trends coming out of ExhibitorLive! 2015. In a complete contrast to the neon look is the use of distressed wood and steel. Sort of the old workshop look that projects history of fine craftsmanship and old school artistry. For companies rooted in manufacturing, this provides a great environment for your visitors to experience your “old-school” skills and rich company history. This system features an aluminum extrusion/frame with a groove or channel, which is paired with a fabric featuring a strip of silicone sewn onto its edges. The silicone is then slipped into the groove on the aluminum frame to secure it and create a wrinkle-free, taut display with finished edges. If you are interested in learning about ways to make your trade show graphics stand out, give us a call. We are here to help.